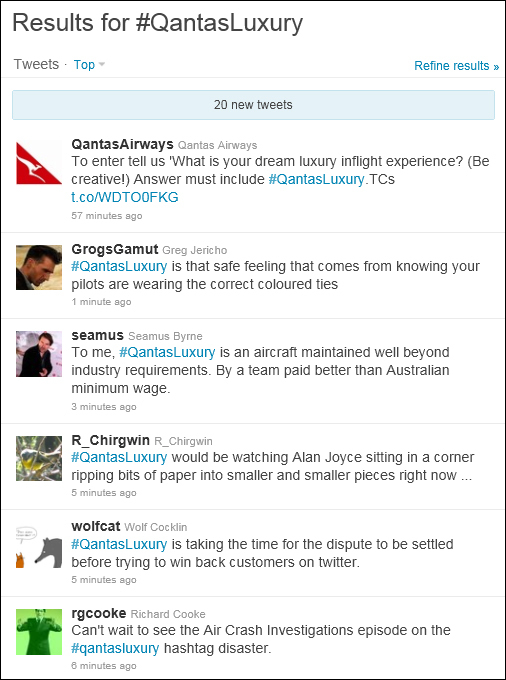 I’m currently watching a branding mistake unfold on Twitter (#qantasluxury). The idea is a good one, but the timing is a disaster. (c) tweets must include the hashtag #QantasLuxury. Unfortunately, this is all happening at a time when the Qantas brand and reputation is really at rock-bottom in the Australian community. The last thing you should be doing is putting your brand in the hands of that community through a social media campaign like #qantasluxury. If I was Qantas, I’d be sticking to channels where I can completely control the corporate image and message, and keeping my head down when it comes to social media and, to a lesser extent, traditional media. The other problem is, with the runaway branding train that is happening at the moment on Twitter, how do you stop it?